Buying/Selling | MMSB = My Mental Scape, Baby! For years, MOMD has wanted a treadmill. Literally, years. 2 years ago, when we were spending Christmas on the Rock with his family, and his Mom got a new treadmill (she had worn out the other one), he was so jealous he was almost in tears. I have watched flyers for him around boxing day, thinking that perhaps we could buy one after the Christmas madness. No matter how good a deal it was though, he never made a purchase. 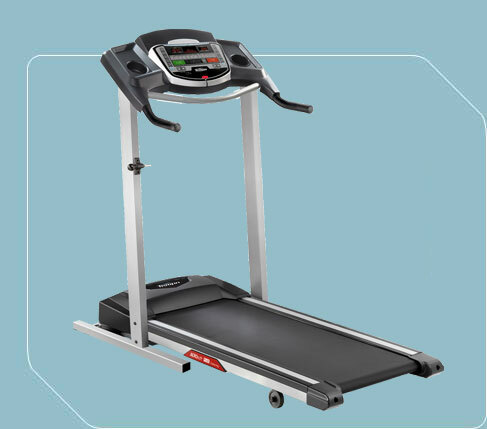 A couple of months ago my Aunt mentioned on Facebook that she was selling a treadmill. And a couple of months ago, MOMD was about to turn 40. So I thought, it would be a perfect gift for him: get him the treadmill he’s always wanted! Thing was, the price was over our “don’t need to discuss before spending” limit (which is $100, so *most* things are well over this limit) and even thought his birthday was a milestone one, I knew he would not be pleased if I made this purchase without his involvement. So I told him what I was thinking. And he was over the moon excited! My aunt was selling this because she – like almost everyone I’ve ever heard about – was excited to get this, but then life got in the way and she couldn’t make time to use it. It happens, right? All the time, to all of us, I know. Her desire to declutter her home of things that she is no longer using, was our gain. We went out to her house, changed the configuration of our seats in the van, and got the treadmill back home. MOMD was so excited! He set to work getting it reassembled, and in the perfect location for all his treadmilling. “I don’t have to worry about going to the gym,” I could see his smile saying. “I can make time for a run once the kids are in bed,” I knew he was thinking. “This is so awesome – I’m going to be healthy in no time,” I imagined him saying. But really: I can’t be the only one who finds this funny, can I? There’s something about the spring, isn’t there? That gets you thinking about renewal, about starting to shake up your routine and introduce something new… For many, they start to get itchy feet thinking about where they’re headed and speeding up to get there faster. And of course, there are those who become obsessed with real estate. A friend of mine has been looking for a place for a couple of weeks. Maybe a month now. And another friend of mine has been chronicling the hunt she’s on for the family’s dream home for a few weeks now on her blog. Another friend is talking about selling her place and getting something else for her and her family to move too. And while it’s true that MOMD & I are utterly happy here in our home, I find myself from time to time scoping out MLS to see what’s happening out there. What would I move for? What would MOMD & I need to find before we were willing to consider it? Well, we lost our guest room the moment we learned that Number 3 is arriving this summer. It’s become Connor’s room, Sam moved into Connor’s old room, and Sam’s old room has become the nursery. So we no longer have a room for our family who Come-From-Away to stay when they are here. (Did I mention that my in-laws arrive on July 2, and the baby will be delivered on July 5? True story. And there’s no where for them to sleep for the duration of their 2 week stay.) So I guess we would look at moving if we could get a 5 bedroom house. And you know, if the basement were finished here then we *would* have a 5th bedroom. So I guess if we found a house with 5 bedrooms, and a finished basement we could move for that. And it would have to have a fantastic kitchen. Because you know, my kitchen is all right. It’s nothing fancy, although the size is wonderful when you consider that I came here from a 6-cupboard + 1 drawer kitchen before this. But it’s builder basic stuff. One of my friends has just bought what was a model home and let me tell you: THAT is a gorgeous kitchen*. *Note: that kitchen is totally wasted on her, she who hates to cook!